Is Columbia majoring in union-busting? In 2016, the medical assistants and lab technologists who care for students at Columbia University’s student health clinic voted to join 1199SEIU; a move that made particular sense since 1199 has represented hundreds of workers at Columbia for decades. The eight women, who work to provide the best quality of care to students, had hoped for a relatively seamless process in securing a fair contract so that they could better provide for themselves and their families. Their 1199 colleagues already had a contract, and they proposed that Columbia simply fold them into this preexisting agreement. Now it’s 2018, and these women still don’t have a first contract. Columbia management has not only refused to fold them into the preexisting contract, they seem intent on fighting these workers on just about everything, including affordable healthcare and fair wages. They have even fought workers on non-economic provisions, such as a health and safety committee that would give workers the ability to ensure the better conditions for themselves and students, and a sexual harassment provision within the contract, despite the fact that all eight workers are women of color. 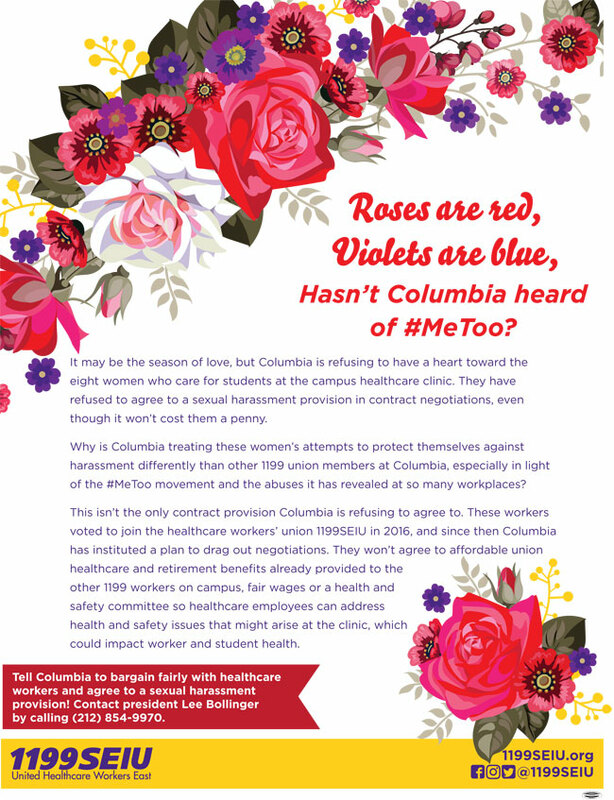 Given our current reckoning about the prevalence of sexual violence and misconduct across industries, we find Columbia’s resistance to a sexual harassment provision very troubling! Sign our petition to support good jobs at Columbia! 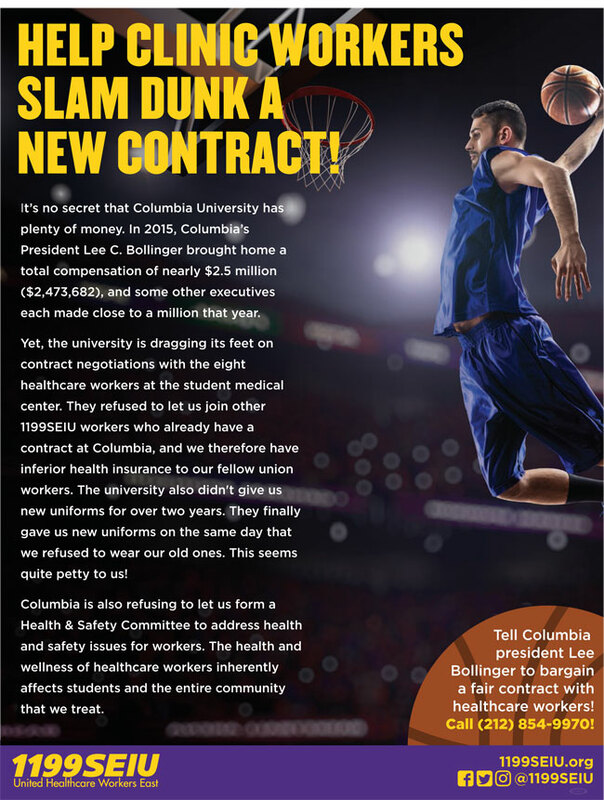 It’s no secret that Columbia is a rich and reputable university that can afford to treat its workers fairly. The university has an endowment of $10 Billion, and undergraduate student tuition is nearly $55,000 per year. Why then is Columbia wasting resources on fighting its own workers? It seems like Columbia is trying to slash workers’ rights and union strength throughout its campus. In addition to fighting these healthcare workers, Columbia has refused to bargain with graduate workers represented by UAW 2110. Why is a powerful university like Columbia, whose mission should be to educate students and give back to the community, wasting resources on fighting workers on the wages and benefits they deserve? See our flyers about the #Columbia8!